Begin by speaking to Bill Teach in Port Phasmatys. You begin by speaking with pirate captain Bill Teach in the Phasmatys Inn. He will tell you that his crew has deserted him and that he needs help to escape the port alive. Agree to help him and meet him on his ship which is docked on the pier to the east. Once you set sail you will watch a cut scene. Another pirate ship is attacking you and you must stop them! First you must swing over to the other ship and disable their cannon. Open up the gun supplies chest and take a fuse then open the repair supplies chest and take a coil of rope. Also don't forget to grab a tinderbox while you are below deck. Now go above deck and climb up a rope ladder to the mast. Use your rope with some of the "hoisted sails" and your character will swing across to the other ship. Once you are aboard the enemy vessel you need to place your fuse into their barrel full of gunpowder. Light the fuse with your tinderbox and watch the fireworks. Now grab the rope near the front of the ship and swing back to your own. Talk to Bill for further instructions. Since they no longer have a functioning cannon Bill wants you to repair the three holes in your hull. Go below deck and take out a hammer, three sets of planks, 30 tacks, and three swamp pastes. Use the planks with the holes then smear swamp paste on to seal them up. Congratulations you now have a water-tight ship! Go back up and speak to Captain Teach again. He now wants you to plunder their ship before sinking it. Swing on over to it just like before and go below deck. Plunder the chest, loot the crate, and pillage the barrel you should now have six pieces of plunder. Go back to your ship and store them in your "Plunder Chest." Now go back to their ship again and repeat this process or switch worlds (there is not enough plunder on any given world at one time). Once you deposit ten pieces of plunder the chest will be full. Speak to Bill Teach yet again and he will ask you to repair the cannon. First take off the broken barrel then go down below and get a new one from the gun supplies. Use the barrel with the cannon and voila it is fixed. Now comes the fun part... Bill wants you to destroy their ship. Go below deck again and take out a fuse, a ramrod, and a canister. Go above deck and take some gunpowder out of the powder barrel. When you load the cannon make sure you load it properly or it will explode and you will have to repair it again. Clean it out with the ramrod. Shove the powder in with the ramrod. Once you injure their crew with the canister you must now fire three cannon balls to sink the ship once and for all. Go down below and take out at least three cannon balls and three fuses for this part (you may want to take a couple extras just in case you fail this next part). Now take three batches of powder out of the barrel and fire the cannon the same way you fired it before. Except use a cannon ball instead of a canister of course. Hurray, you have defeated those naughty rapscallions! Bill will sail you to Mos Le'Harmless and you get to watch a cut scene where Bill chats with "Mama." Quest Complete! 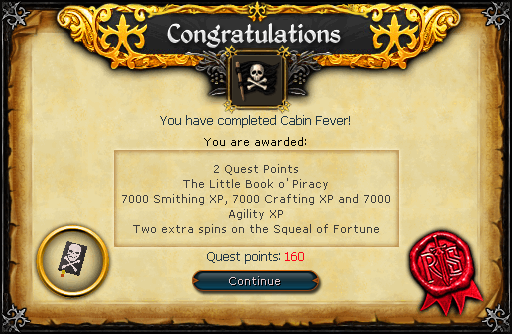 Book O' Piracy 7,000 Smithing experience 7,000 Crafting experience 7,000 Agility experience Ability to travel to Mos Le'Harmless and buy pirate equipment. Speak to Bill Teach to get an additional 10,000gp. 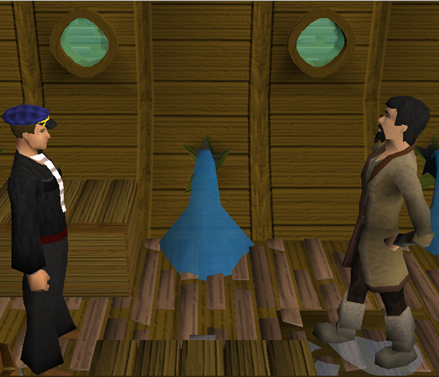 Bard Roberts in Port Sarim's pub will sing you a shanty of the adventures you had on this quest. 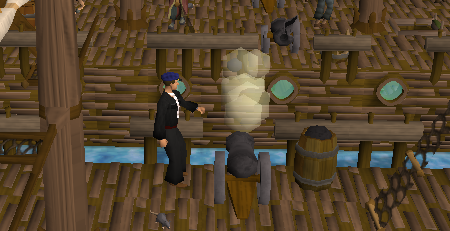 The "Little Book o'Piracy" will teach you some pirate lore and gives tips on how to dress like a pirate. It also has a convenient glossary at the back that will help you learn the technical pirate jargon. This book is important because it lets you talk to the pirates!